On a Sunday afternoon in 1906, two determined men hurried down the platform for the London train in Lime Street station. One was carrying a leather holdall with the whole of Saturday’s takings from Lewis's – Liverpool’s largest department store. They stayed overnight in a London hotel and the next morning were waiting outside a Solicitor’s office for it to open. The cause of this drama was that land on the north side of Speke Road was up for sale and there was at least one other interested party. This rival, it was learned on the Saturday afternoon, intended to complete the purchase at 10.00am on the Monday. At that time purchases had to be in cash. The banks were closed, so no cash was available. All seemed lost. It was then that Lewis Cohen offered to lend them all of Lewis's Saturday’s takings to provide the cash. The purchase was completed just ahead of the rival. Lewis Samuel Cohen was a director of Lewis's Limited and regarded as one of the country's greatest shopkeepers. In 1899 he purchased Doe Park, the house and 45.428 acres, with the intention of creating a golf course. It was ready for play towards the end of 1900 and Woolton Golf club was born with nine holes – hence the later determination to obtain the land in 1906 to extend to eighteen holes. From all this it can be seen that Woolton Golf Club was virtually Lewis Cohen's creation. It was founded with a deliberately liberal ethos, the success of which can be judged that by 1914 there had been Anglican, Jewish, Non-conformist and Catholic Captains of the Club. The second signature in the membership book is that of a lady and although we cannot establish the date, our ladies had a vote very early in the Club’s existence. J.F. Clegg ("Cleggie") was a power in the club for fifty years. He inspired the formation of Liverpool Golf Captains, and it is due to him that Woolton was accorded the privilege of holding its St. Andrew's Night Dinner always on November 30th. He was Captain of the Society from 1939 to 1948 and the first five annual competitions 1908, 1911, 1912, 1920 and 1921 were all held at Woolton. Frank Fawcett was our best known member in the post-war period. 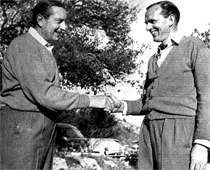 He won the Monaco Open in 1953 and the Formby Hare in 1955. His name is on the Formby Honours Board and on the Woolton Board a staggering seventy-seven times. He played for Lancashire, and was President of Lancashire UGC, President of the English Golf Union, member of the R & A and Chairman of CONGU. His experiments led to the introduction of broad wheeled trolleys. We hope that visitors will enjoy the course and fellowship as we have done and that they will roam the fairways seeking the perfect round in that spirit of hope which golf gives to its enthusiasts.